Southwest USA certainly isn’t the cheapest holiday destination. That doesn’t mean a road trip through this beautiful area full of natural wonders isn’t possible for travelers on a budget. We have traveled 26 days through four states in high season for less than $2,000 per person, including our international flights and rental car. We are happy to share some useful tips to ensure that you too can experience such an adventure. This article also allows to estimate your expenses correctly! First of all, a general tip: be aware that in the USA most prices are shown excluding taxes. This not only applies to hotels and restaurants, but also to supermarkets. The taxes can vary, so it is worth to take them into account. The prices in this post include all taxes and are based on two people. To stay within your budget, obviously the first step is to score an affordable airline ticket. Sometimes this may take a while, especially if you – like us – are traveling in high season. Keep an eye on the fares, be flexible with your travel dates and do not focus on one airport. The latter applies to both your departure and your arrival. We live near Ghent (Belgium) and always look for tickets leaving from the airports of Brussels, Amsterdam, Paris and Düsseldorf. 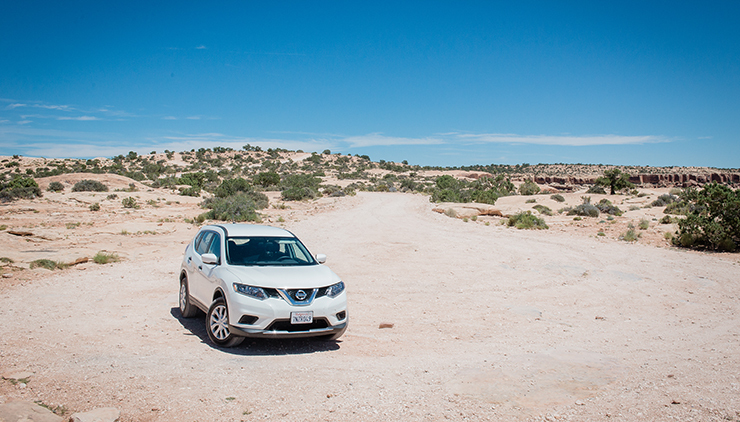 There are many routes possible in the Southwest, so also for your destination there are several possibilities. The cheapest solution is usually over San Francisco, Los Angeles or Las Vegas. Note that sometimes it is cheaper to fly into one airport and out of another. This might complicate your search, but does increase the likelihood of a good offer! In early March, we booked our flights with United Airlines (Dusseldorf – San Francisco – Dusseldorf) departing late June for €520 per person. No direct flight, but one stop of about 3 hours in London. Go camping! It’s more beautiful, more cozy, more intimate and cheaper too! Often you can enjoy the most spectacular views from your tent. 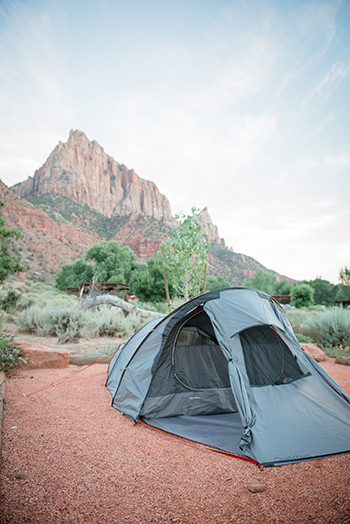 If you opt for campgrounds in the national parks, you don’t have to spend time driving to and from the park in the morning and evening. 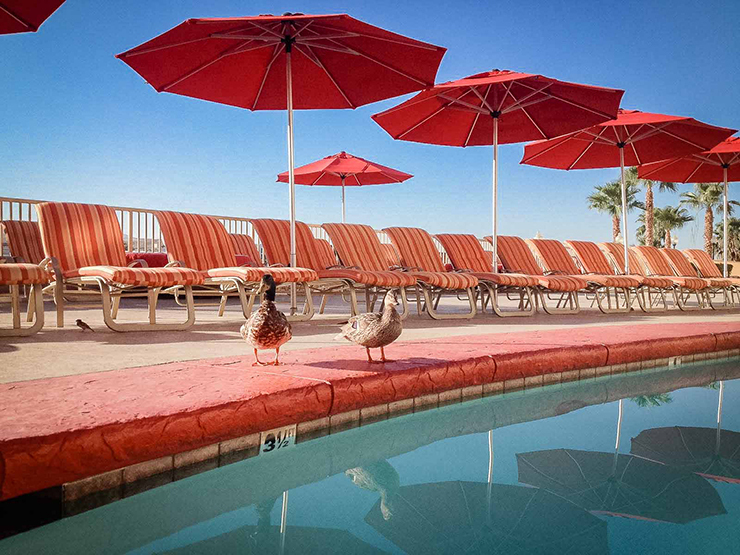 You’ll stay amidst the natural beauty! Note that for most parks you do have to reserve your spot a few months in advance. The campgrounds are justifiably popular and therefore often fully booked in summer. 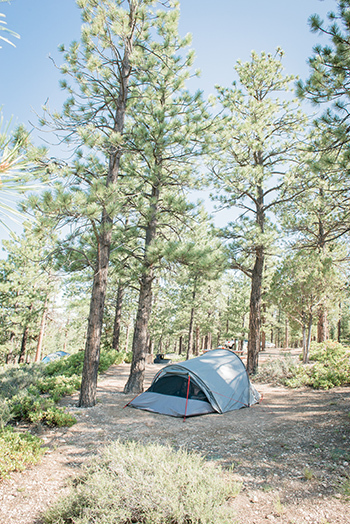 For 25 nights – including 20 nights camping – we ended up paying $803 or an average of $32 per night for 2 persons. While camping, you automatically barely go to restaurants. Much more fun is an intimate barbecue on your own fire pit. Supermarkets in the US are generally huge so you easily gain ideas for your dinner by campfire! Although most national parks also offer a wide range in their general store, plan your purchases on the road between the parks. Within the parks, you should expect to pay approximately double the prices of a supermarket. Your purchases can be kept cool in a disposable cooler box of $2.5 and you can find ice anywhere to refill regularly. Sometimes you’ll want to taste a typical American hamburger (our preference? In-n-Out burger!) but of course that won’t shoot up your budget. Also an extensive all you can eat buffet is nice! Again, if you choose the right place this doesn’t need to be expensive. We enjoyed a delicious buffet for $15 per person including drinks – even cocktails! – at a casino in Laughlin. It’s been a long time since our bellies were so full! On our whole trip we spent $705 or $27 per day together on food and drinks. And be sure: we have eaten! It is best to book a rental car online from home as long as possible in advance. Often you can cancel your reservation later free of charge, if you found a cheaper option or just changed your mind. Do already think about the start and end of your itinerary. If you want to visit the city you fly in or out, you probably don’t need to book those days. This again saves you some money. Make sure you take a GPS device with you from home. The rental companies charge outrageous amounts for it. Of course do not forget to update the maps! Nowadays there is also a wide range of useful apps for your smartphone. Booked almost 4 months in advance, our rental car costed us $710 for 23 days through RentalCars.com – that is $31 per day. For this amount, we rented a spacious Nissan Rogue, in the same category as Ford Escape and Toyota Rav4. Fortunately, gasoline is relatively cheap compared to Europe. Moreover, by keeping an eye on the prices and not filling up just anywhere, you can save a lot of money. Indeed, there is a very wide spread in gasoline prices. We have seen prices from $2.05 to $4.00 and more per gallon. To be complete: 1 gallon is about 3.8 liters. In total we drove 3677 miles and needed $307 for fuel. Chances are that it is interesting for you to purchase an Annual Pass. 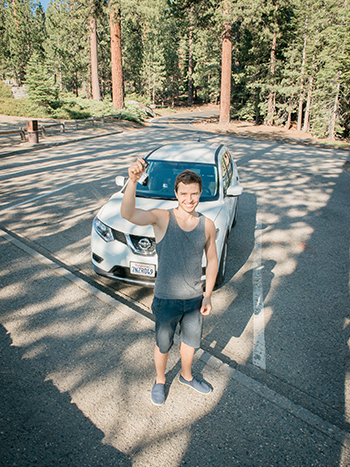 For this, you pay $80 (per car) and it’ll give you access to all national parks. When your itinerary includes three or more national parks, you’re better off with this pass. You can buy the pass online or at the entrance of the first park you visit. Please note that not everything is managed nationally. 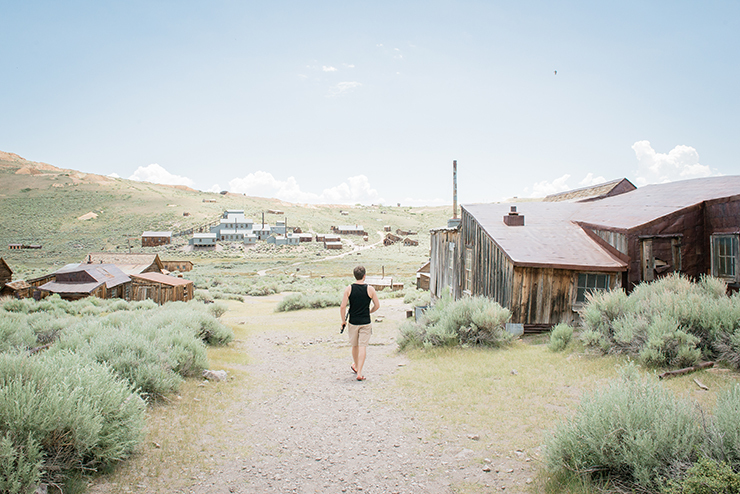 So when visiting Bodie, you will still have to pay $8 per person. 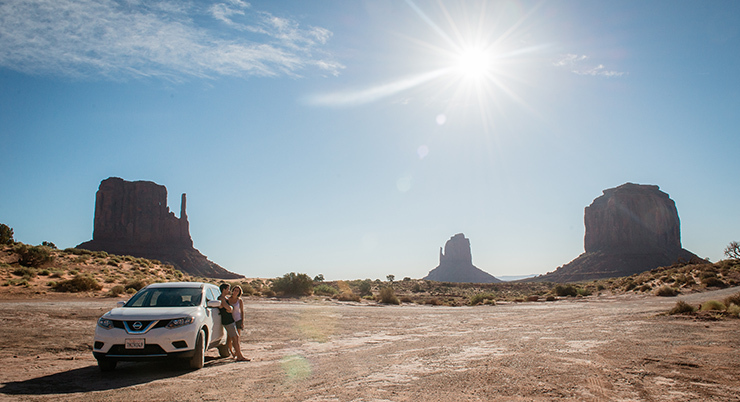 Entrance to Monument Valley – managed by the Navajo Indians – is another $20 per car. Transportation to and from the airport can be arranged very cheap and quick with Uber! This code gives you an instant discount of $20 for your next trip: C6BMD8AMUE. This way, we drove in San Francisco in a gleaming BMW with leather interior from our hostel in Fort Mason to the airport for only $0.63! Nice, isn’t it? Public transport would have been much less comfortable (dragging your luggage!) and more expensive! Finally, there are some costs that do not fit into the categories above, such as the purchase of a camping shower bag and cooler box, the tokens for showers and washing machines, parking costs, … All together, these expenses came to an amount of $23. A simple math shows a total budget of $1,332 per person excl. flights for an unforgettable 26-day road trip through the most beautiful and diverse natural parks on earth. Do no longer doubt, this is a once in a lifetime experience and is worth so much more! 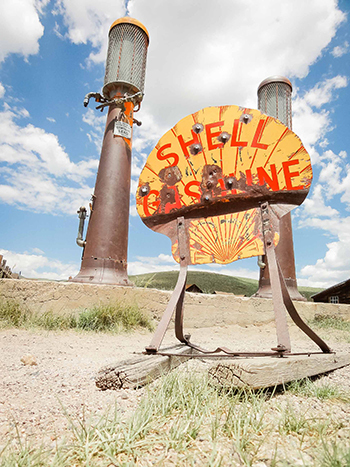 How did your road trip end up going?